Gender and feminist studies; Islam and Muslim societies; transnationalism and globalization; migration and diaspora; tourism; Middle East and South Asia. 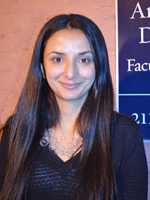 Dr. Attiya Ahmad is an Associate Professor of Anthropology and International Affairs. Broadly conceived, her research focuses on the gendered interrelation of Islamic reform movements and political economic processes spanning the Middle East and South Asia, in particular the greater Arabian Peninsula/Persian Gulf and Indian Ocean regions. Dr. Ahmad is currently examining the development of global halal tourism networks. 2017 Ahmad, A. Everyday Conversions: Islam, Domestic Work and South Asian Migrant Women in Kuwait. Durham, NC: Duke University Press. 2013 Navarro, T., B. Williams, and A. Ahmad. "Sitting at the kitchen table: Fieldnotes from women of color in anthropology," Cultural Anthropology 28(3): 443-463. 2012 Ahmad, A. “Labour’s limits: Foreign residents in the Gulf.” In M. Kamrav and Z. Babar, eds., Migrant Labor in the Persian Gulf. New York: Columbia University Press. 2012 Ahmad, A. “Cosmopolitan Islam in a diasporic space: Foreign resident Muslim women’s halaqa in Kuwait.” In F. Osella and C. Osella, eds., Islamic Reform in South Asia. Cambridge University Press, forthcoming. 2010 Ahmad, A. “Explanation is not the point: South Asian migrant domestic workers' newfound Islamic pieties in Kuwait,” Asian and Pacific Journal of Anthropology 11(3-4): 293-310. Reprinted in P. Werbner and M. Johnson, eds., Diasporic Encounters, Sacred Journeys: Ritual, Normativity and the Religious Imagination among International Asian Migrant Women. Routledge, 2011. 2009 Ahmad, A. “Transnational actors and state stirrings: Kuwait’s migrant domestic work sector.” In Migration and the Gulf. Washington, DC: Middle East Institute. Henry Luce/American Council of Learned Societies Fellowship in Religion, Journalism, and International Affairs, 2017. In Residence at the Institute for Religion, Culture and Public Life, Columbia University (New York, USA), 2017-18. NSF Cultural Anthropology Senior Research Grant, 2017-2019. GW Dean's Research Chair Award, 2017-2020. Visiting Scholar, Department of Sociology, Boğaziçi University (Istanbul, Turkey), 2015. Fellow, Stanford Humanities Center, Stanford University, 2014-15.